The win by Toyota Gazoo Racing SA is a triumph for local engineering know-how and an example of how private companies can also fly the SA flag high. Even though it was Qatari driver Nasser Al-Attiyah’s third win in the Dakar Rally, he paid tribute to the team that put him there: “Thank you for letting us drive this car,” he said. 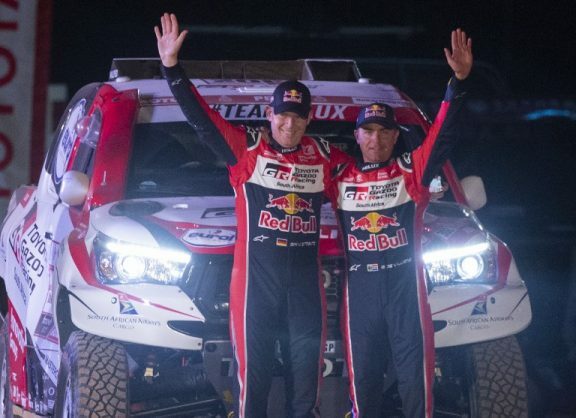 That car was a Toyota Hilux – purpose-built here in South Africa by Toyota Gazoo Racing SA – which became the first petrol-engined vehicle to win the punishing motorsport event in the 10 years it has been held in South America. The win is a triumph for South African engineering know-how and an example of how private companies can also fly the SA flag high. Apart from being one of the toughest events on the international motorsport calendar, this is where top global brands spare no effort to cross the finishing line first. It is a pity that South African driver Giniel de Villers – who won the Dakar for Volkswagen some years ago – was unable to be on the podium. He finished ninth because he selflessly waited for Al-Attiyah on the last stage, to be able to help if something went wrong. This victory shows that we, as a nation, can be the best in the world … as long as we remember the value of working together.